Happy Shark Week, friends! Although Shark Week (does that really need to be capitalized?) really comes during the summer, you can do a shark week theme any time of year! 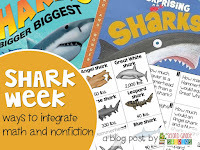 I love to do a week about sharks toward the end of the year when my kiddos are starting to lose interest and need something engaging and exciting to keep that interest going. And what's more interesting to kids than sharks?! I like to get as much mileage out of a topic as possible, so I'm always looking to find ways to integrate different subjects. I love to start my shark week activities with a book - and there are TONS of great books about sharks out there. 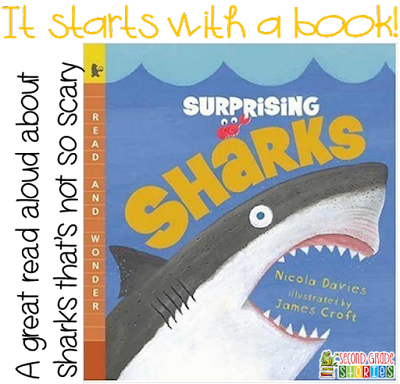 My favorite one to start out with is by Nicola Davies, called Surprising Sharks. The biggest reason why I like to start with this book is that it makes sharks a little less intimidating. Don't get me wrong, the author shares some amazing shark facts that definitely make my kiddos say, "WOW!" - but the illustrations and focus are a little less scary - and by the end of the book everyone wants to know more about these animals! 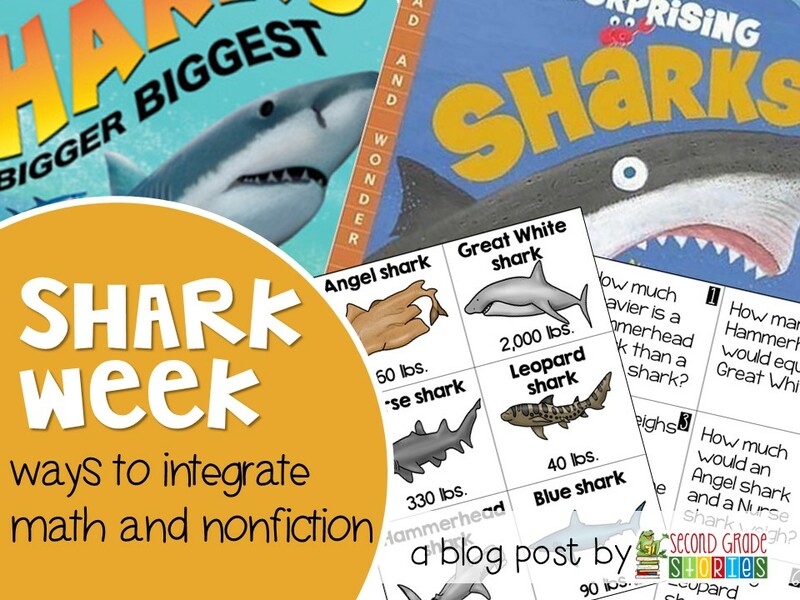 I always like to integrate nonfiction into everything possible - and studying sharks is a great opportunity to bring in some math! This book by Jerry Pallotta is so much fun. The book uses math to teach information about sharks! 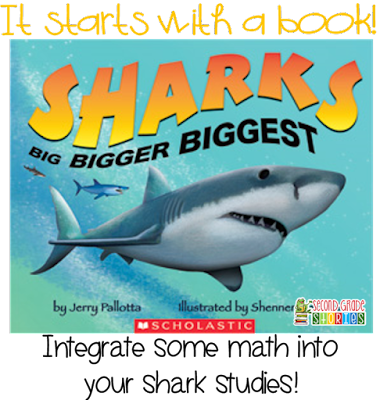 There is everything from the size of sharks (big, bigger, biggest), to how much they weigh, how far down they can swim, temperature, etc.... this book puts a new twist on learning about sharks! The focus in this book is on greater than and less than, but you could fit any shark facts into your math curriculum. Have students do some research and find out different numbers that have to do with sharks. Challenge them to come up with questions comparing information about two or more sharks. 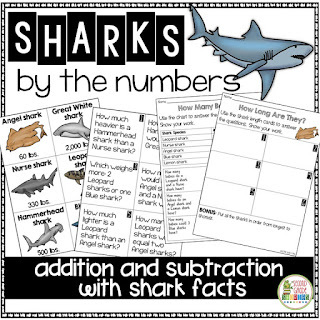 Create a "Math About Sharks" poster with a shark illustration and facts that include numbers. Here's a little freebie I created using the weight of different sharks. You could use this in lots of ways! 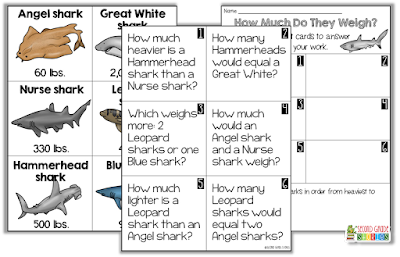 Hang the task cards around the room and give each student a copy of the shark facts and answer sheet (double-sided). Students walk around the room using their fact sheet to answer the questions. Shrink down the answer sheet (85% works well) and have students glue it into a notebook and write their answers there. Use it as a center! 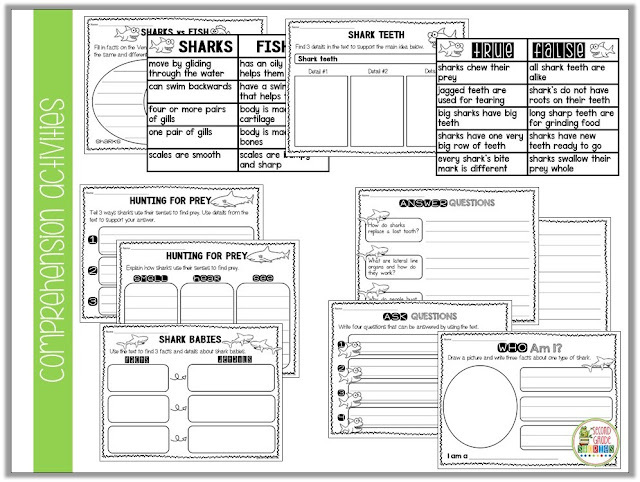 This freebie is part of a larger resource with even more ways to integrate math and shark facts. Click on the image to see the entire resource. Looking for MORE shark activities? I love using reader's theater in my classroom! 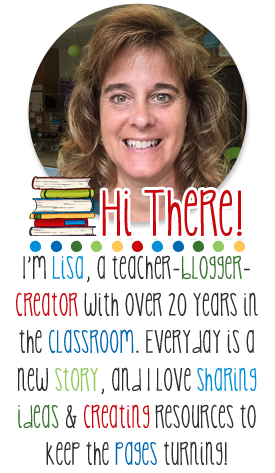 It's just another way to integrate subjects - this time nonfiction/science and reading fluency. This resource contains 4 partner plays and 2 reader's theater (6 parts) scripts. There are comprehension activities to do with all the plays. 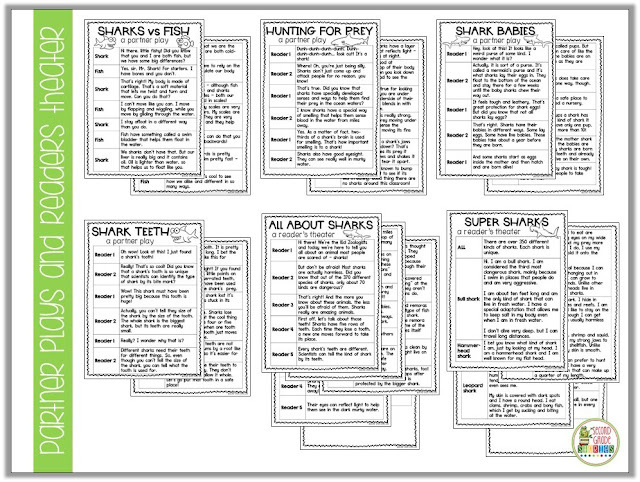 There's also a flip book to go with the "All About Sharks" script, and a fact card sort for the "Super Sharks" script. They're all written at about a mid-end of second grade level. You can click the images to find out more! Confession: I had not heard of "shark week" until a few days ago, but it sounds like so much fun, we'll have a shark week this year! I really like the way you're bringing the math and literacy together. Thanks.